Happy New Year's Eve from Kansas City. Here's the view from my room in Crown Center, where I attended my high school prom a *few* years ago. And just so you know, I used Starwood points to pay for my room, or I wouldn't be The Elegant Thrifter! May your year be filled with all things beautiful and bright, from my hometown to you. Thank you for all of your kind words, gracious visits and wonderful ideas. 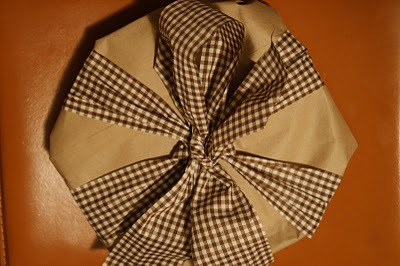 In my preparations for Christmas this year, I vowed to thoroughly use what I had on hand to make cards and wrap gifts. So all the ribbons I bought at the Independence, Missouri, estate sale of Diane Houk, known for her puppetry artistry, certainly met my thrifty needs, especially since the entire box of gorgeous ribbons only set me back about $5. I was reminded of this estate sale extravaganza that my sister and I visited last summer by Adrianne DeWeese's enlightening column in The Examiner , Independence, Missouri's daily newspaper and how she Houk sold her collection of Nativity scenes that she collected through the years in her world travels. Just knowing more about the person who sold these beauties makes me appreciate them even more! On this chilly, Kansas City day where the effects of a blizzard has paralyzed the East Coast and there's icy frost on the trees here in the Midwest, I'm longing for the the simplicity of a beach cottage -- one practically under-decorated with finishes that have faded under the sun's constant caress and textures speckled and splotched by the salty air's kiss. Just like I did about this time a year ago, I decided to share with you some images I photographed on the Fire Island community of Saltaire while doing research for The Find: The Housing Works Book of Decorating With Thrift Shop Treasures, Flea Market Objects, and Vintage Details. lovely, washed-out family photographs that accentuate the setting of a brilliant sun porch. It's because of beautiful places like these that Mary-Ellen shared with me and gracious supporters like you that The Find is an enduring reality. And like I've told you before, if you purchase a copy of The Find, let me know, and I'll gladly send you a personalized bookplate. One of the highlights of my trip to Kansas City is a visit to Hall's, one of the remaining few specialty department stores in the United States. 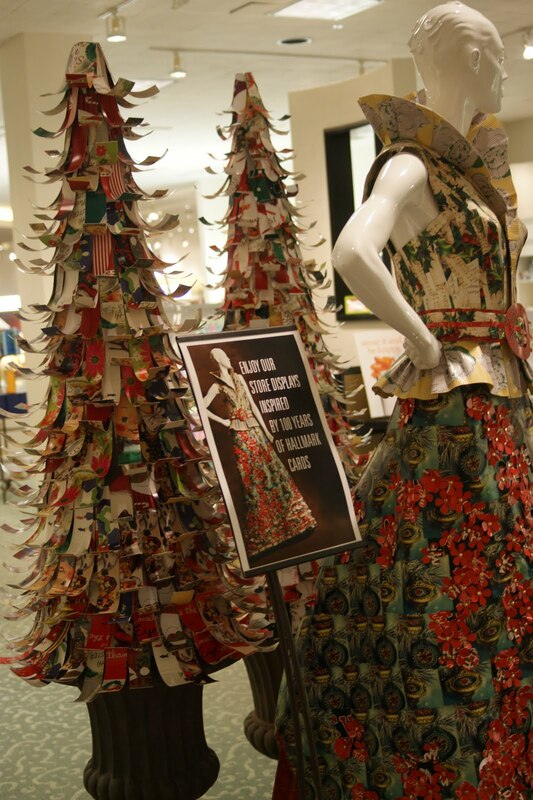 Owned by Hallmark, which calls Kansas City its home, the company celebrated 100 years of making greeting cards by using its own nostalgic imagery to make the holiday ornaments that decorate its two stores -- one in Crown Center and the other on the Country Club Plaza not far away. If you are worried that the creative team chopped up 100 years worth of vintage charm, I was assured that instead, they scanned the festive scenes from their archives to craft them into wreaths, garlands, fanciful fashion and trees, all gloriously displayed throughout the stores and in their windows. 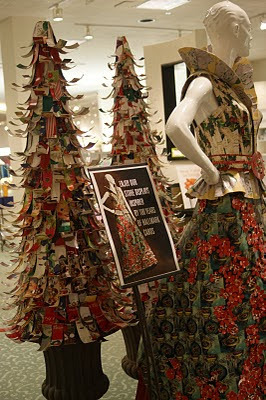 Even though Christmas is passed, I'm contemplating taking all the cards I've collected each season and turning them into a tree for next year. 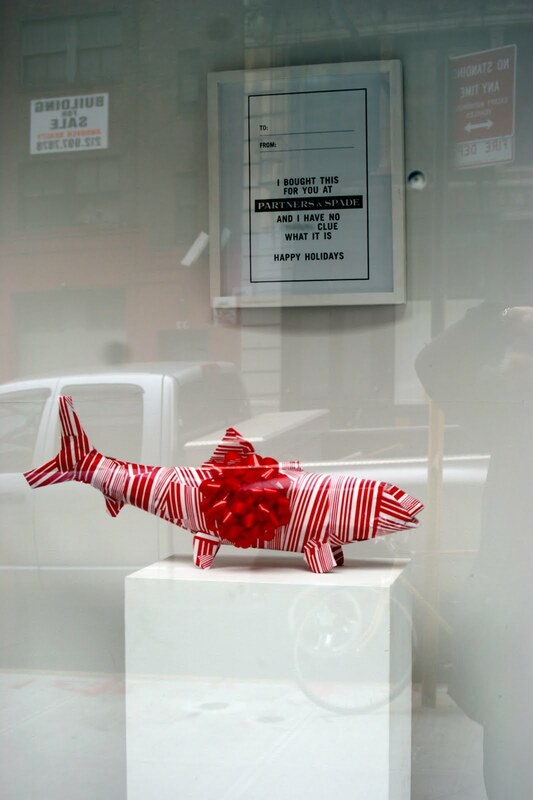 Santa took a pit stop in the Paul Smith windows on his way to deliver his bounty. What did he leave for you? Here's wishing you a glorious Christmas Day! 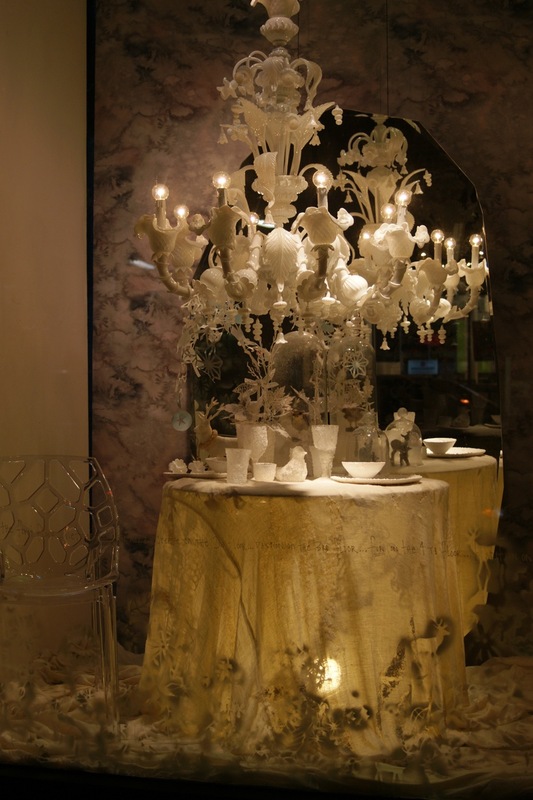 Holiday Window Shopping: The ABCs and More! After taking in all the seasonal spectacles Uptown yesterday, I headed downtown to ABC Home to take in its always-unique take on mixing modern with vintage and to investigate around the neighborhood for other surprises. 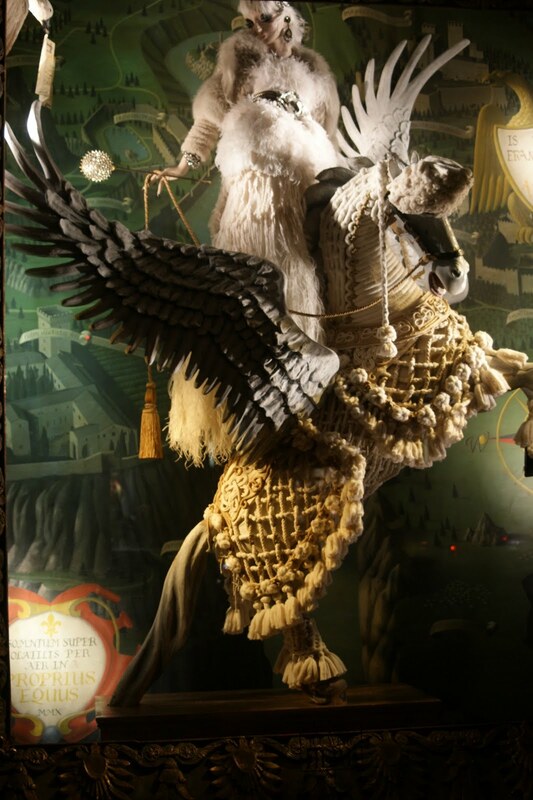 This year's glorious displays could have been taken from the fantasy-laced portfolio of the inimitable Tony Duquette, known for creating atmospheres from unexpected objects. The symmetry of this tree shaped structure if formed from curved chair backs, pendant fixtures and long-legged stools. 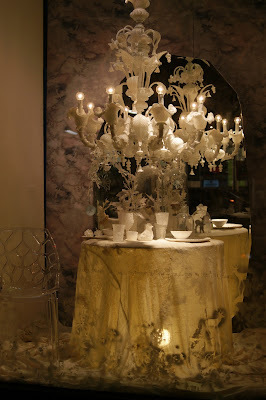 And who wouldn't want to take a seat at this wintry white table all aglow with mystery and intrigue. I turned the corner and found this surprising idea of turning socks into festive finery at the discounter Daffy's! 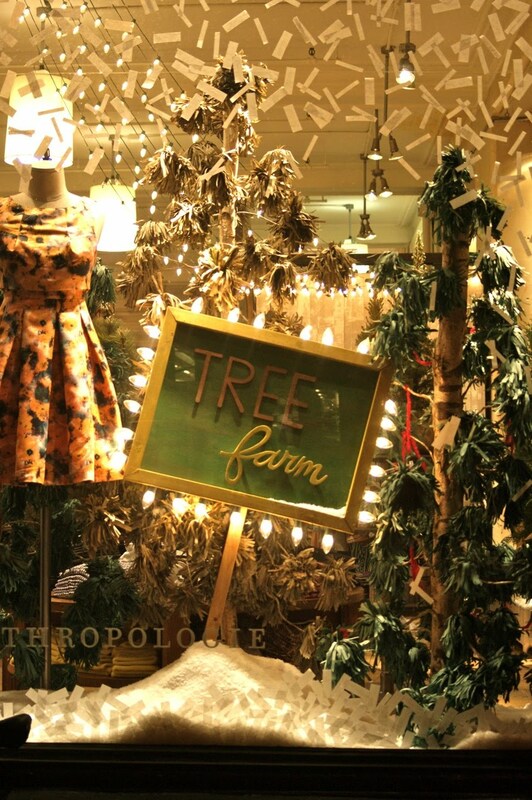 And just in time for Christmas Eve, Anthropologie set up a Christmas tree farm filled with crafted paper creations all covered with snow. What do you think Santa will leave under your tree this year? Happy holidays to all my dear digital friends! You can't visit New York during the holidays without a visit to the Barneys New York windows known for its hilarious take on pop culture. This year's efforts served up windows inspired by famous foodies, all enrobed in their Snuggies! The guys get their own window with a raucous table that looks as if its collapsing under this weight of testosterone. I'm amazed at how realistic the faces look. The bodies, however, look as if they've been on an uncharacteristic diet! I love how all around the windows, platters, bowls and pans have been repurposed as medallions paying tribute to great cooks the world over. On Fifth Avenue, I was awed by the angels twirling inside Henri Bendel before being enchanted by the dream scape presented by Bergdorf-Goodman on Fifth Avenue. 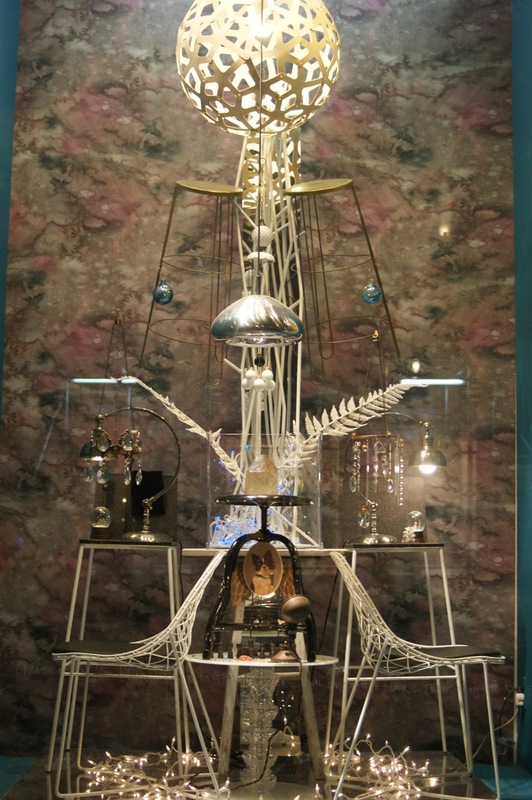 Once turning the corner onto 57th street, Bergdorf's shares its less serious side, which is perfect for putting me in the mood to head downtown to see what's on display there! The best thing about window shopping during the holidays is that it doesn't cost a penny. And that's a great thing, especially when perusing the glamorous and glitzy vitrines of designer shops on Madison Avenue. 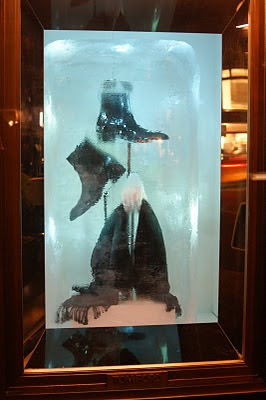 I started my wintry stroll at Ralph Lauren. 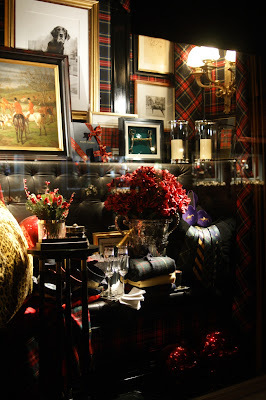 This masculine montage in what Ralph refers to as The Mansion is classic, yet colorful, with a mix of cozy tartans, hunting scenes and a champagne toast set for two! Cheers! 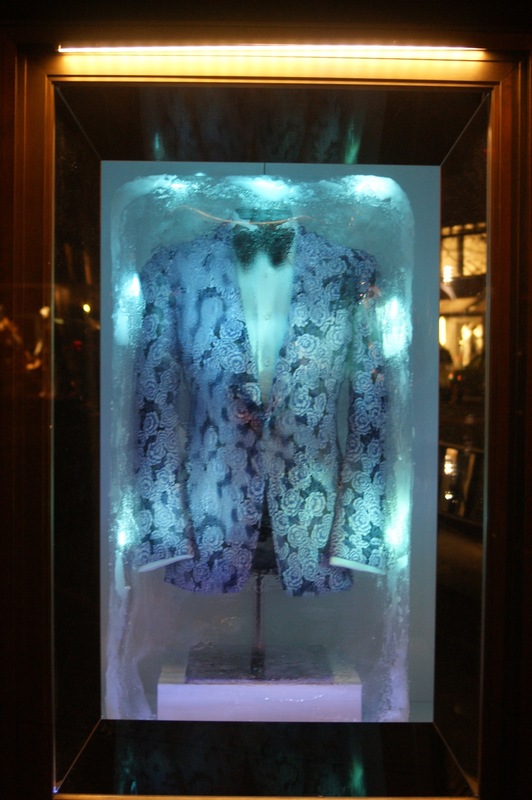 Speaking of cocktails, Tom Ford's creatives must have raided a gigantic ice bucket for display pieces in his inimitable presentations. Appearing as if they are frozen in time, these goods were right at home during the winter chill of late-night Madison Avenue. The French brand Hermès offered dramatic, yet organic displays for its luxury goods. 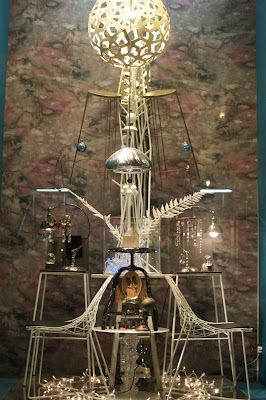 Created by Charlie Baker of Baker Structures, they show clever use of natural finds for unique prop pieces. 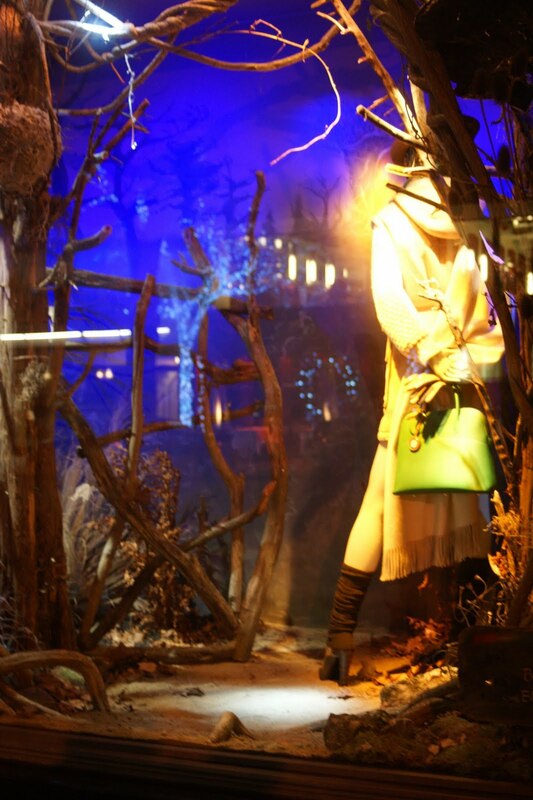 Tomorrow, we head over to Barneys New York for a food fest, and then peer into the fantasy-wrapped windows of Bergdorf-Goodman. Here's a gift wrapping tip from Partners & Spade if you aren't trying to keep your offering a surprise! The Object of My Desire: Singing Along! 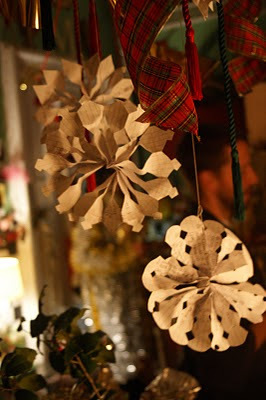 As Christmas is on it way, I'm sharing with you one of my all-time favorite thrifty gifts offered to me last year by the generous and talented Sonya at Dime Store Thrift. 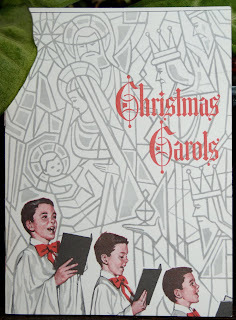 This heartwarming gem from the 1960s reminded me of practicing for grade-school assemblies in the Hanthorn Elementary gymnasium and singing all the old songs in an old country church in Mansfield, Missouri, accompanied by the plunking of an out-of-tune piano and voices that seemed to be crooning in a variety of keys. This Gift of Thrift found at a thrift shop for $1 was just begging to be gifted. All I had to do was fill this made-in-England-for-Hallmark container with some cinnamon stars and gumdrop bars, tie a bow on its top, and it was ready to go! When it's party time at my Brooklyn pal Michael Quinn's home, I'm always treated to festive decor known for its unique, personal flair. These snowflakes are made out of what Michael calls found paper and flutter joyfully amidst a colorful tartan ribbon. Frugal Fun: A Cookie Star! As you may know, I've been serving up The Gift of Thrift this holiday season by offering baked goods on thrift-store dishes that I've purchased for pennies on the dollar. 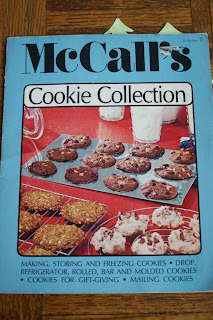 What's more, my recipes come from vintage recipe books -- like this McCall's Cookie Collection that I found lying on the sidewalk in Carroll Gardens, Brooklyn. 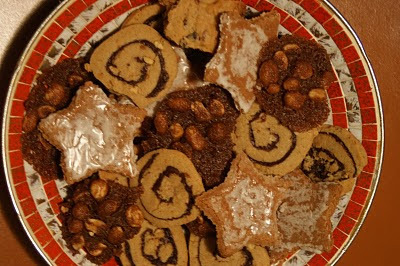 Several of you have asked for those recipes, so here is my favorite for Cinnamon Stars at it appears in a chapter titled "Cookier Cookies for Goodier Giving." Note, however, that even though this recipe is super-easy to achieve, it takes two days to complete since the dough has to refrigerate overnight. 1. In small bowl of electric mixer, let egg whites warm to room temperature -- about 1 hour. 2. With electric mixer at medium speed, beat egg whites until soft peaks form when beater is raised. 3. Add 1 1/4 cups of granulated sugar to egg mixture, 2 tablespoons at a time, beating after each addition. Continue to beat until mixture is very thick and glossy -- about 10 minutes. 4. In medium bowl, combine almonds with cinnamon. Stir in egg-white mixture; mix to combine well. 5. Refrigerate dough, covered, overnight. 7. 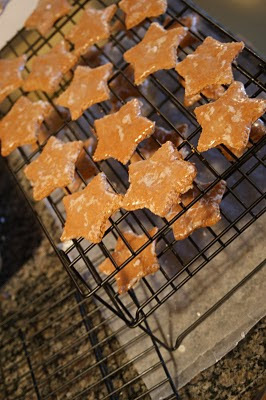 Use 3-inch cookie cutter to cut out stars. Place 1 inch apart on lightly greased cookie sheets. 8. 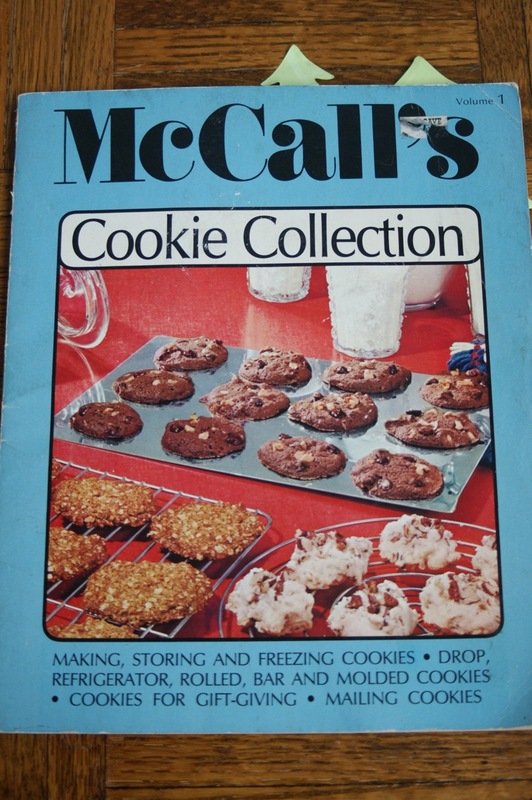 Let cookies stand, uncovered, at room temperature, 2 hours. 9. Meanwhile, preheat oven to 300F. In small bowl, combine confectioners sugar with 2 tablespoons water; mix until glaze is smooth. 10. Bake cookies 20 minutes. Brush tops with glaze and then cook 5 minutes longer. Remove from pan; cool on wire rack. And here's what you should end up with! I'd never made these before, but they were a complete success on the first try and are among my new favorites. What are your favorite holiday treats? With the holiday festivities already underway, make your tablescapes unique by creating an eye-catching centerpiece from an unexpected object. 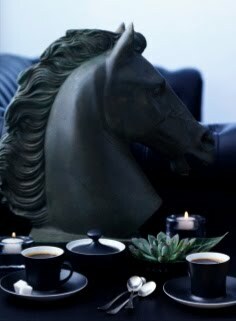 In The Find: The Housing Works Book of Decorating With Thrift Shop Treasures, Flea Market Objects, and Vintage Details, prop stylist Joe Maer displayed a stallion's bust as the focal point among black and white dinnerware for a moody, yet masculine effect. What items have you used to add excitement to your tabletop displays? I ran this post a year ago, but the sentiment of the season still rings true. One of my favorite Christmas memories involves my childhood next-door neighbor Mrs. Barr. She was an independent, working-gal widow who liked a little nip in the evening and went all out to decorate for Christmas. Her home was packed with antiques, an endless collection of pewter, and a fireplace that always had a roaring fire inside when the outside temperature dropped. When Dad mowed our yard in the summer, part of my sister's and my task was to gather the pine cones under the tree so they weren't propelled into the air like supersonic missiles. We saved them in bushel baskets and gave them to Mrs. Barr who loved the snapping and popping they made when she tossed them into her fire. They also added a delicious subtle pine scent to her warm and glowing den. Mrs. Barr always invited my sister and me to help her decorate her tree. (We loved visiting Mrs. Barr, so much so that Mom limited our time with her so as not to annoy. 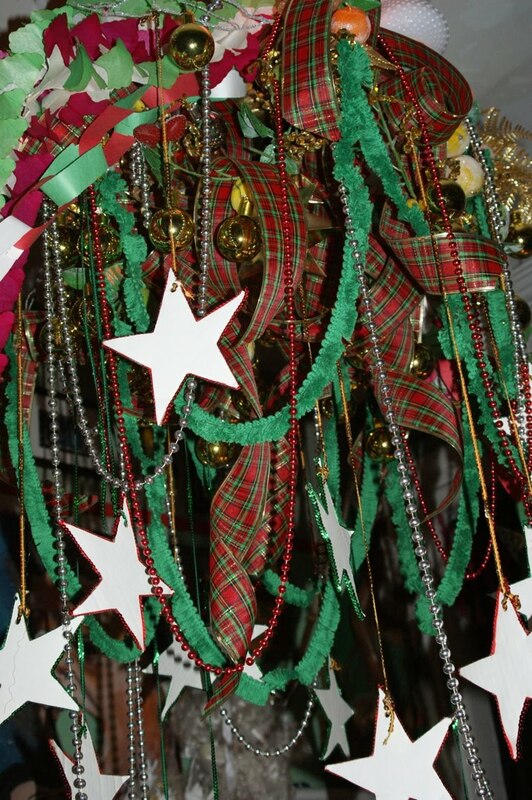 To keep on schedule, Mrs. Barr set her oven timer so when it buzzed, it was time for us to head back home) Before the decorating began in earnest, we first had to choose a theme for the tree, which she had divided into many boxes. Would it be an all-white dove theme, or what about simple red ribbons? And for her fantastic mantle, she removed all the everyday antiques and replaced them with caroling figurines and characters from Charles Dicken's "A Christmas Carol," all lovingly wrapped in fragrant pine branches. 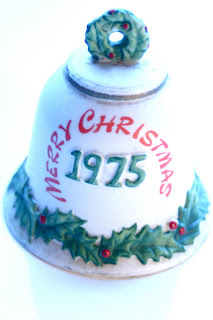 Mrs. Barr gave my sister and me each a porcelain bell back in 1975, and I have mine with me in New York. Every time I pick it up from the kitchen shelf where I keep it all year long and hear its fairy tale ring, I'm reminded of being home for Christmas. 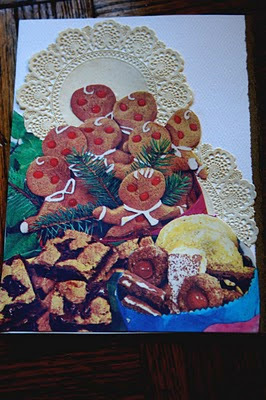 I baked up cinnamon stars, peanut clusters, peanut butter pinwheels and gumdrop bars -- all recipes from vintage cookbooks -- and placed them in this pretty mosaic dish found at Goodwill for about $2. 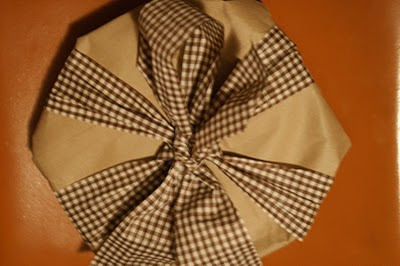 After covering my goodies in wax paper, I wrapped them in a clean, paper grocery bag and tied the whole thing up in a gingham ribbon I found at an estate sale in Kansas City! Here's a peak at how I repurposed the "Royalies" I showed you last week by adding them to the collage of images I scanned from a vintage Christmas book for my holiday cards. How could you not have a party if you mounted this hanging centerpiece in the middle of your ceiling? Made from mix-and-match ribbons, plastic beads, cardboard stars, glass balls and paper chains, this one highlighted a Mexican themed holiday party that my Brooklyn pals Michael Quinn, Heather Kerr and Ron Rangel threw last year. The Find: Try Your Luck! If you'd like a personalized copy of The Find: The Housing Works Book of Decorating With Thrift Shop Treasures, Flea Market Objects, and Vintage Details, Mr. Goodwill Hunting is giving one away. Go check him out and all his thriftiness! And as I've told you before, if you purchase a copy of The Find and would like to have it personalized, just drop me a note with your information, and I'll happily send you a signed bookplate in the mail. 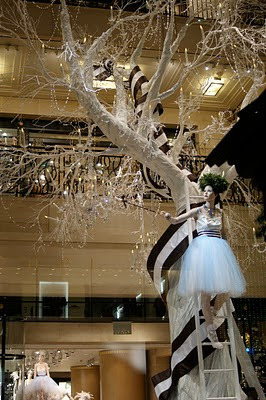 Object of My Desire: Oh, Christmas Tree! 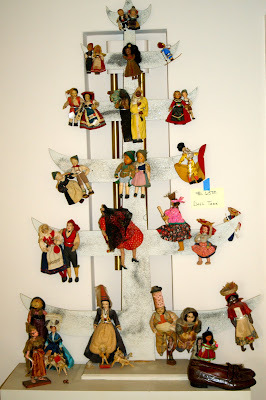 You can make a Christmas tree out of about anything, and this doll tree I shared with you a while back from an estate sale in the Pacific Palisades proves my point. Clearly, the couple who lived in this home loved world travel, and these dolls representing the far corners of the earth display their thirst for new cultures and exciting experiences. I like to imagine they carefully plucked their favorite dolls representative of the country they had visited, and then lovingly perched them on this handmade wooden tree. 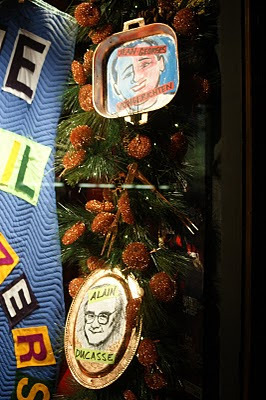 This might also have been one of their favorite holiday decorations. I'm especially attracted to this doll tree because it shows how a personal collection can be cleverly grouped and proudly displayed as a decorative object in a room decor. The tree, at $65, was being whisked away by another couple as I was staggering out of a room full of old certificates and diplomas, vintage photos, travel brochures, love notes and hand-made Christmas cards. The added touch of whimsy for me is this pair of croc loafers that just happens to be resting beneath the tree, just as if they were placed there awaiting goodies from Santa! 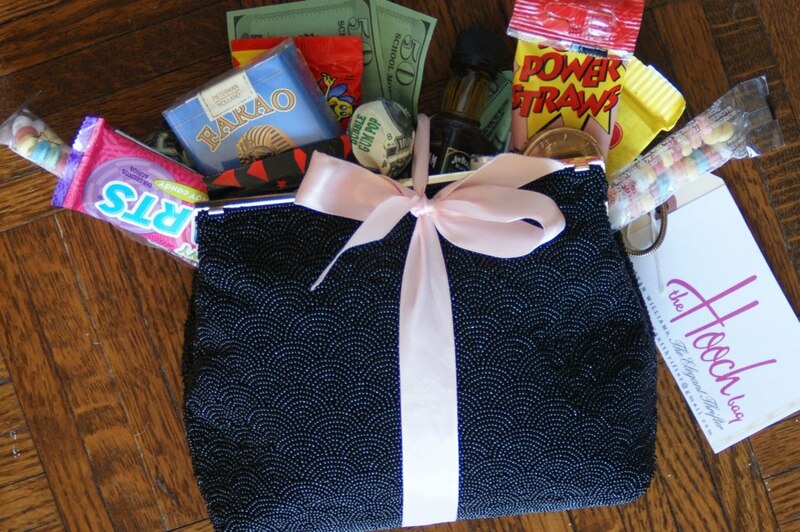 I've told you how I like to make special gifts out of vintage bags called Hooch Bags, a naughty-but-nice little pretty packed with funny money, candy cigarettes and a discrete nip. I always personalize the bags based on the receiver's personality, and since this one has a major sweet tooth, I headed to Economy Candy on the Lower East Side to fill this exquisite, dark lovely full of retro-goodies! I saw this unique use for a old 45 rpm record carrier in a vintage-inspired apparel store in SoHo called Scotch & Soda. Since it seems that hardly anyone listens to vinyl any more, this little green case was repurposed into an amusing merchandising display for knit hats! Some people absolutely detest doilies. Now I wouldn't say I'm a lover or a hater, but when I ran across a box full of vintage paper Royalies from the late '50s or early '60s marked a dime a piece at a garage sale in Independence, Missouri, I picked them all up for a future project. "So many write how Royalies cut down their laundry bills, for they're as easily dispensable as paper napkins! More and more women say that they use Royalies with every meal, not merely when they entertain. You, too, can use Royalies in countless ways to brighten your home life and make eating fun!" What might you do with a package of Royalies? I'll show you what I'm doing with mine in a few days! With holiday festivities on the way, it seems like I'm always looking for innovative ways to offer my guests a cool beverage. You could an elegant ambiance by packing a table with multiple champagne buckets, all teeming with a different type of bubbly or line up an array of punch bowls each filled with a different celebratory libation. 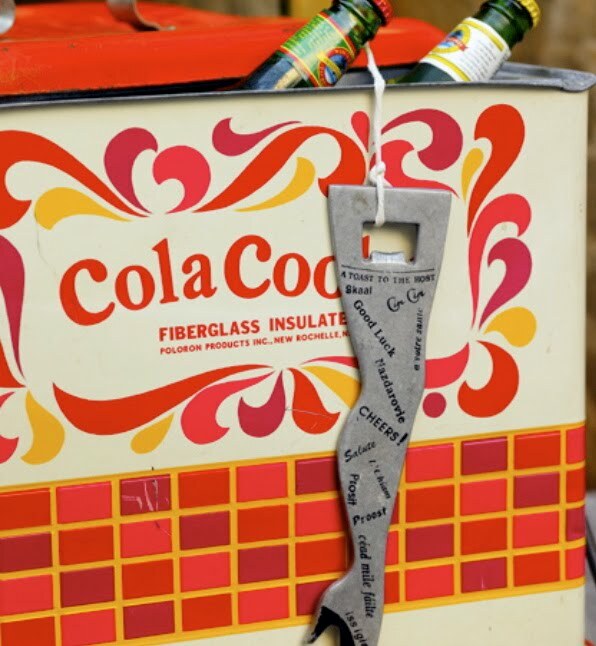 I like the way Michael Quinn and Heather Kerr stowed their bottled beverages at a party they threw for The Find: The Housing Works Book of Decorating with Thrift Shop Treasures, Flea Market Objects, ad Vintage Details. In this image photographed by Jim Franco, the two used a vintage metal cooler that allowing guests to whet their whistles without having to wait to be served. I've used old buckets, vintage metal picnic baskets and even old planters for the same purpose. But always be sure to place your containers within a base that will keep liquids from leaking onto the floor and risking a slip! I saw this sign on The Bowery and quite like its ... ahem ... uplifting message. I love sharing what I call The Gift of Thrift, especially when it concerns sharing great press with a good friend. Check out the Associated Press story here that just ran about shopping for the holidays at vintage and thrift stores where the reporter interviewed me and my LA garage-sale shopping pal Ruth Handel! What better way to celebrate Thanksgiving than with a glittered gobbler, especially since today is the day that Glitterella herself, Sonya at Dime Store Thrift is set to announce the winner of my book The Find: The Housing Works Book of Decorating with Thrift Shop Treasures, Flea Market Objects, and Vintage Details. Here's wishing you a shimmery and shiny holiday with family and friends. Let's see, what do I have on the agenda today: baking, baking and more baking! Hopefully my results will be a beautiful as the ones in Magnolia Bakery's windows. And oh, yes, I'm looking over my vintage ribbons to select one to tie around a copy of The Find: The Housing Works Book of Decorating with Thrift Shop Treasures, Flea Market Objects, and Vintage Details that Sonya over at Dime Store Thrift is giving away. If you win, do you have preference?